Recently my son-in-law's electric golf cart suddenly stopped while the family was on an errand and thankfully, very close to home. He was able to get the cart back into the garage and he asked me to come over to take a look. Well, the battery terminals were covered with corrosion. It was a wonder the cart hadn't stopped running sooner. 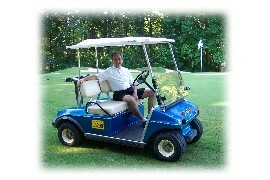 Golf cart battery corrosion is the most common cause for electric golf carts to stop running. After putting on some safety gear, I carefully cleaned the golf cart battery cables and terminals that had the most corrosion. Surprisingly, it was enough to get it going again. With a promise of doing a more thorough golf cart battery cleaning at another time, I left (and then kind'a forgot) since the golf cart kept running just fine. 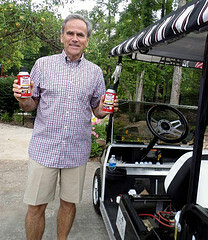 When I returned to my daughter's house I lifted the golf cart seat to check on the batteries and WOW all of the batteries were clean and free of any corrosion. My son-in-law was very proud of his golf cart battery maintenance program and I was too, until I found out HOW he cleaned them. He had taken a hose and with only water sprayed the corrosion off the batteries with a high pressure nozzle. Why is that so bad you may ask? Well, first it is important to neutralize the acid first. Plain water does not do that. By using a mixture of baking soda and water or a battery cleaner spray you can neutralize any acid on the batteries. Use the battery cleaner spray over all of the tops and terminal posts. Let it sit for several minutes while the spray penetrates, loosens and neutralizes acid corrosion deposits. The spray is yellow and then turns pink when it comes in contact with acid. After the acid has neutralized use a wire brush to remove the heavy deposits. You can then clean it off with a low power spray.